Once you have these installed it's time to set up a folder in which to create the vehicle. 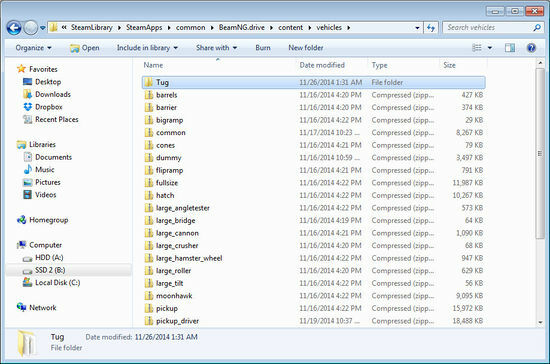 This folder will go in your Beamng.drive/content/vehicles directory. Give the folder a short name which is relevant to the vehicle you're making. For this tutorial, I'll be creating a simple vehicle based on an airport tug, so I've named the folder “Tug”. 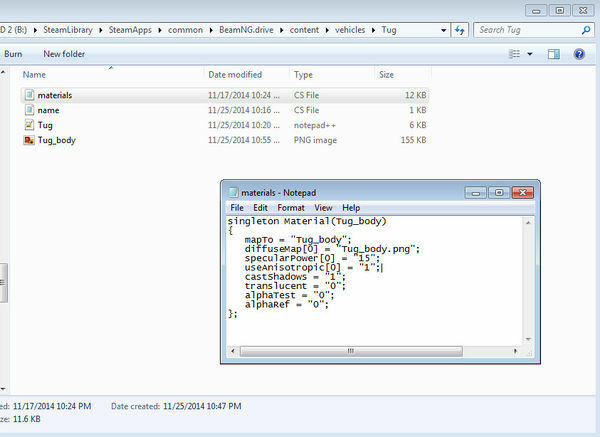 With our folder in place, we can open it up and add the all-important Jbeam file. 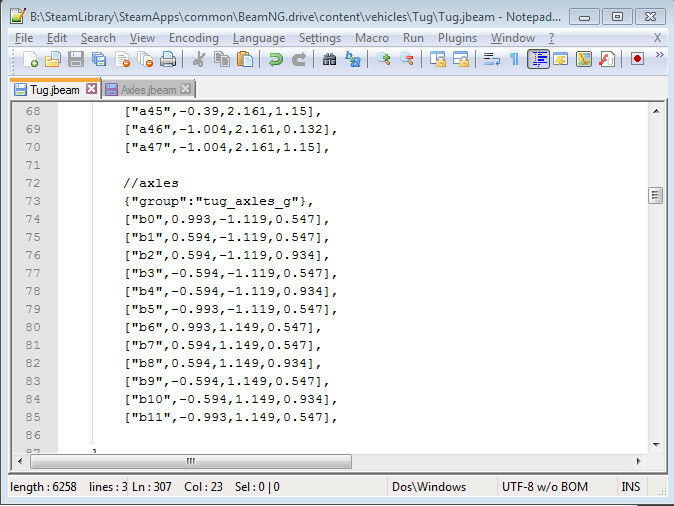 This is essentially the bare bones of a Jbeam file, containing all that we need to start working on a vehicle. As you can see, there are three main sections: “information”, “nodes” , and “beams”. We'll add data to the nodes and beams sections later on, but for now you can go ahead and replace the information fields with your own author name and project name. Although this is a valid Jbeam file, it contains no data about the structure of the vehicle. To produce that data, we're going to construct a node and beam (n/b) structure in Blender. Open up Blender and edit the default cube. You can use it for a scaling reference – each side is two meters long. Bearing this in mind, delete the vertices of the cube and start adding your own, either by using Ctrl-click or extruding (E) from other vertices. Each vertex will become a node, one of the two fundamental components of a jbeam. Nodes have mass but no dimensions. 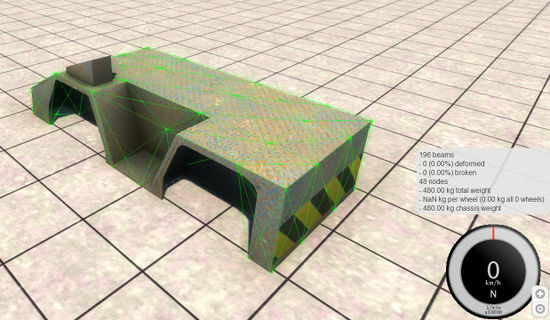 Beams connect nodes and have other physical properties like stiffness and strength. Beams will be represented by edges in Blender. 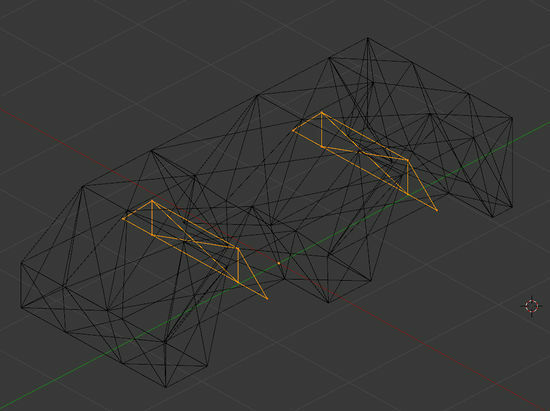 Keep adding vertices and edges until you have blocked out the basic shape of your vehicle. Try to keep the distribution of vertices fairly even, and don't use more than a hundred or so. You can add faces to the model to make it easier to visualize, but they won't be relevant as part of the n/b structure. After finishing the basic body shape of my airport tug, I've only used 48 nodes. 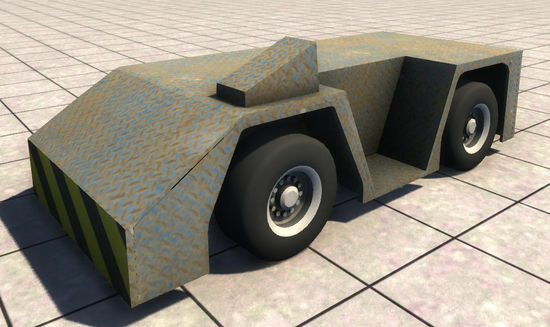 Although the shape looks correct, in BeamNG.drive it wouldn't support itself since it has no cross-bracing beams. To fix this, we need to go back and make sure every face is crossed by two edges to provide rigidity through triangulation. To cross a face, select two opposite corner vertices and press F to create an edge between them. Alternatively you could use the triangulate modifier under the modifiers tab. 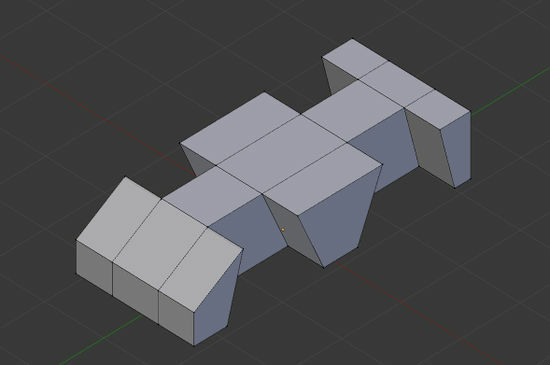 Once all the faces are crossed by two edges, you can exit edit mode and place the model just above the X-Y axis plane so that if it had wheels, they would be just touching the plane. Then apply the location, rotation and scale of the model using Ctrl-A. With the script installed we can now export any mesh object as a n/b structure. 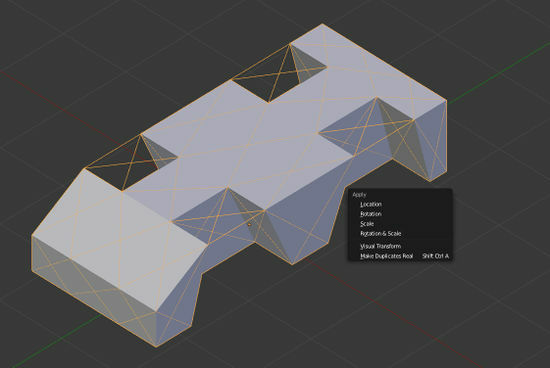 Select the object and export it – the file should be saved adjacent to your Blender file. Open up the file that you've just exported and take a look. It will have the same name as the object you exported it from, so if you haven't bothered to rename the default object it will probably be called something like Cube.jbeam. This isn't a complete jbeam file, but it does contain the node and beam information that our previous Tug.jbeam file was lacking. 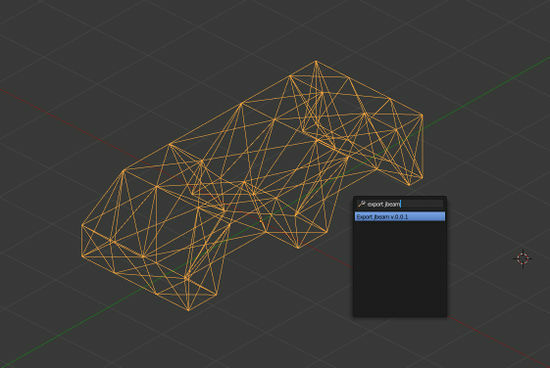 As you can see, each line defines the name of a node (vertex in Blender), followed by the coordinates (x, y, z) of that node. 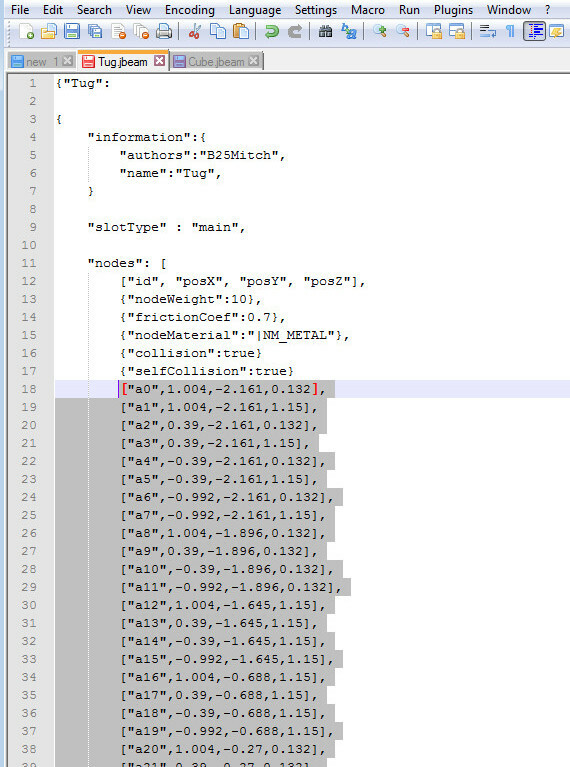 The exporter has given each node a number and a prefix, either “nr” or “nl” depending on which side of the vehicle the node is on. I prefer to keep my node prefixes simple – single letters if possible – so I will use Find and Replace to change all the prefixes to the letter a. 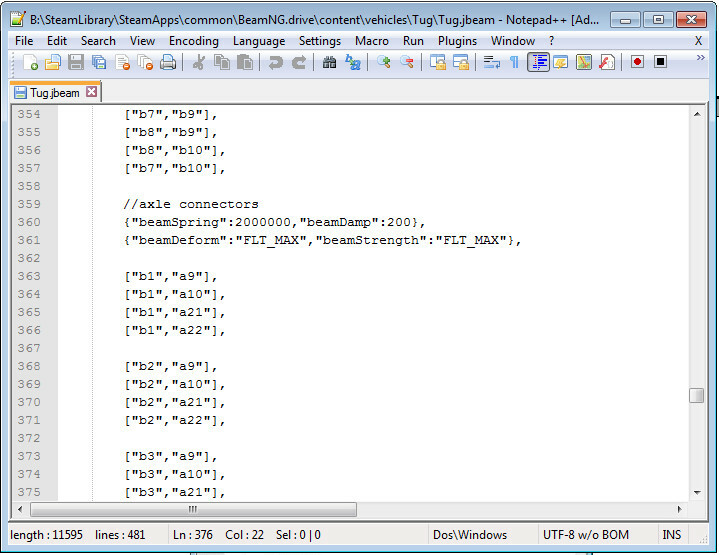 We can now copy all the lines of nodes from Cube.jbeam into our actual project file, Tug.jbeam. Paste them at the bottom of the “nodes” section, under the existing lines. 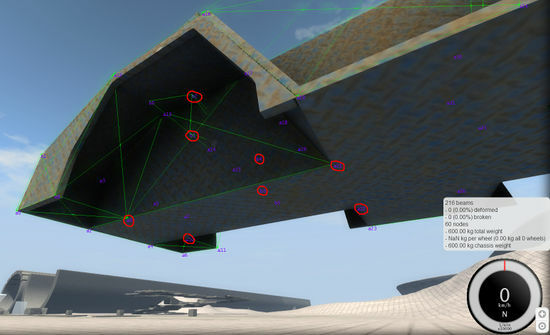 We can now do the same for the beams, which can be found under the nodes section in Cube.jbeam. There will be significantly more beams than nodes: typically they number in the hundreds or even thousands. Paste them in the Tug.jbeam “beams” section, under the existing lines. "Pearl White": "1 1 1 1"
Now, with a jbeam containing nodes and beams and a name appearing in the vehicle selector, it's possible to load the vehicle in-game. Open up BeamNG.drive, go to one of the grid maps and find your vehicle in the browser. Since there's no visible model for it yet, you'll have to press K to turn on jbeam debug in order to actually see it. If all has gone well, the shell of the car will be rigid and self-supporting. 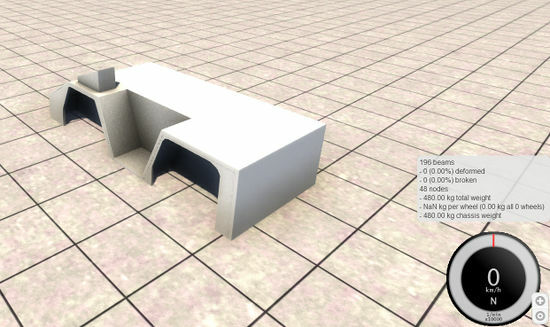 If not, you'll have to go back and add more connecting edges in Blender, re-export as jbeam and copy the revised beam section into the main project jbeam file. At this stage, only the nodes will be able to collide with other vehicles (we'll cover collision triangles later), but you may still want to try hitting the shell with things to test its strength. You can also try adjusting the properties of the n/b structure using the jbeam file parameters. There are several values you can tweak inside the nodes and beams sections. For nodes, you can try changing the weight and friction coefficient. For beams, you may wish to adjust the beamSpring (stiffness), beamDamp, BeamDeform and BeamStrength values. Higher beamSpring values will result in a stiffer vehicle, but go too high and the jbeam will become unstable and explode. However, you can get away with higher beamSpring values if you lower the beamDamp value. BeamDeform and BeamStrength specify the force needed to permanently damage or break (delete) a beam entirely. It might be a good idea to set BeamStrength to infinite (“FLT_MAX”) if that part of the car isn't specifically designed to break away cleanly. 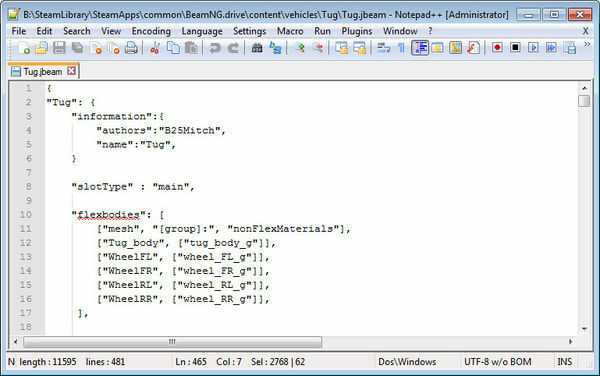 Each time you make changes to the jbeam file you need to save it and press Ctrl-R in BeamNG to reload the vehicle in place. 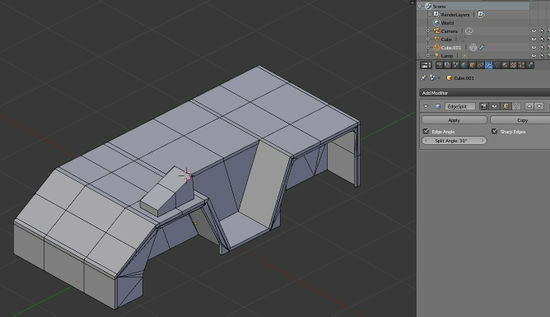 These are all things you can continue to tweak later, so for now let's move on to modeling a visible mesh in Blender. Blender isn't the easiest program to learn, but even a first-day novice should be able to produce a simple model like the one above, using the fundamental key commands: G(grab), R(rotate), S(scale) and E(extrude) to manipulate and add geometry. Follow the key commands with a tap of x, y, or z to constrain the action to a particular axis. You'll also probably want to add an edge split modifier to keep the smoothing groups looking nice. If it's your first model, don't stress over it too much – we're just getting a grasp of the basic skills here. If you're reasonably happy with the shape of the model, it's time to give it a material and texture. First add a material from the materials menu and rename it to something relevant. I've called mine Tug_body. Open up the UV image editor and create a new image, 1024x1024 pixels. This will be our main texture. Now we'll go into edit mode, select all the faces and hit U to unwrap the texture coordinates. Choose “Smart UV Project” for best results. With all the faces still selected, open up our newly created texture from the UV image editor. We'll use Blender's Bake function to automatically generate a simple texture. In the render menu, scroll down to Bake at the very bottom, set the Bake Mode to Ambient Occlusion, and hit the big Bake button. Blender will now start rendering soft shadows onto the texture we just created. Now that we have a rudimentary texture created for us, we can save it into the project folder as a .png file. It's time to export the visible mesh as well – before doing so apply the rotation and scale, just as we did for the n/b structure. Also, name the object something sensible, like “Tug_body”. 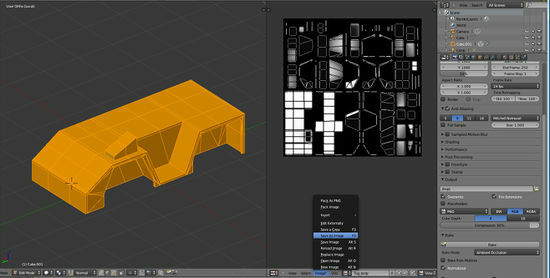 Select it in object mode and use File > Export > Collada (Default) (.dae). 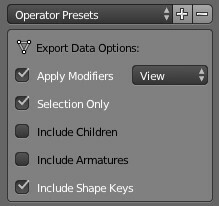 Make sure the “Apply Modifiers” and “Selection Only” presets are enabled. This file will be used to define all the materials on our vehicle. The “mapTo” value must have exactly the same name as the Blender material we created prior to exporting. The “diffuseMap” value must be the exact name of the texture (“Tug_body.png” in this case) that we baked in Blender and saved to the project folder. At this point you'll notice the texture is nothing special, simply some grainy shading in the corners, but that's easy to fix. Let's whip out The GIMP and open up the texture. 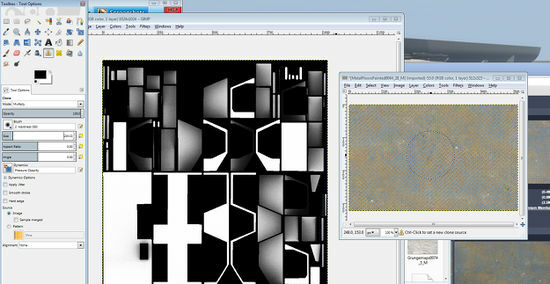 We'll add a new layer which multiplies over the base image and find a free metal texture on CGTextures.com. 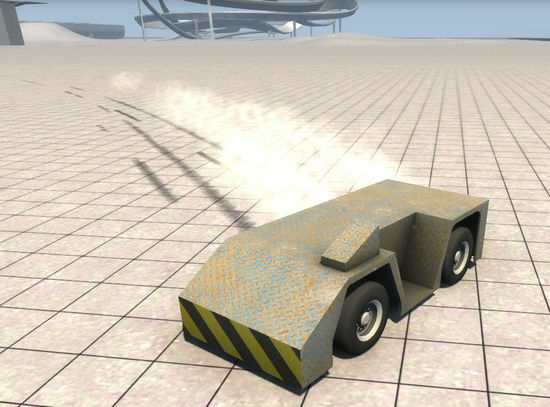 Use the clone tool to paint the metal texture onto the white vehicle texture. With a minute or two of work I've covered the image in in a nice metal pattern and added hazard stripes to the front and rear. 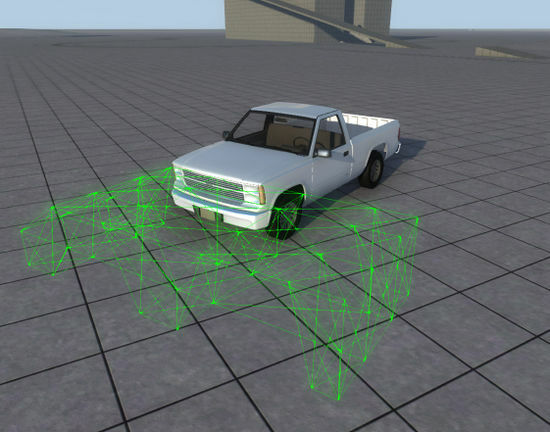 Overwrite Tug_body.png and hit Ctrl-R to reload the vehicle, updating the texture. 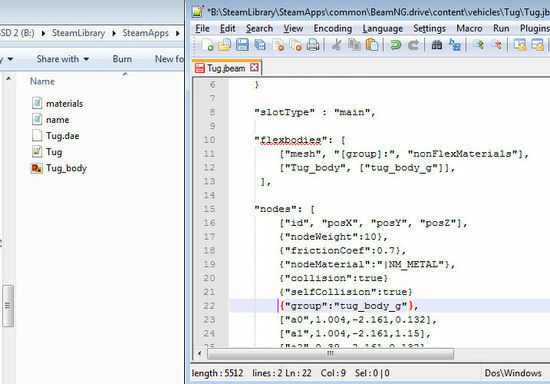 You may have to clear the cache file in My Documents/BeamNG.drive/cache/vehicles, or in some cases, restart the game to force the texture to update. The body shell of our tug is complete but we don't have any wheels, or even axles yet. To fix this, we'll go back to Blender and make a new n/b structure inside the previous one, except as a different object this time. Each axle will consist of four nodes, with an additional node on each side to hold the wheel. The edges(beams) will be set up so as to allow the single nodes on each side to hinge forwards and backwards – this will enable the wheels to be steered. As we did with the body shell n/b structure, apply location, rotation and scale to the axles n/b and use the export script to output the node and beam information. 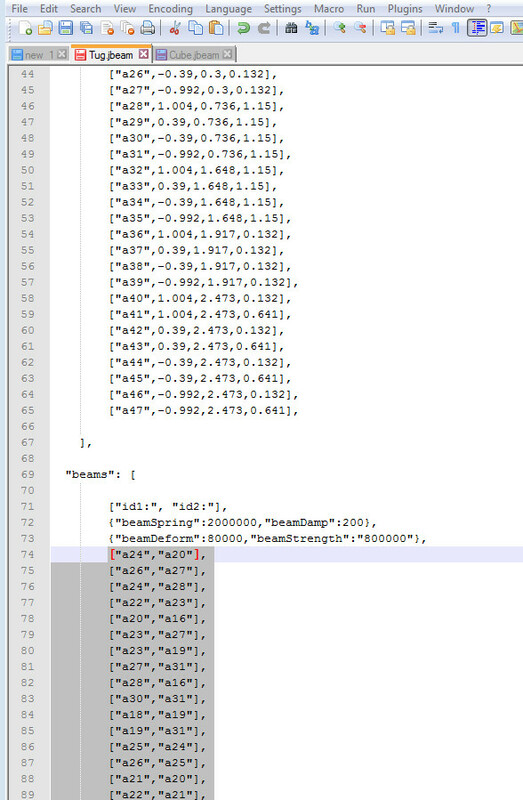 This time we'll rename the node prefixes to “b” to differentiate them from the “a” prefixed body shell nodes. 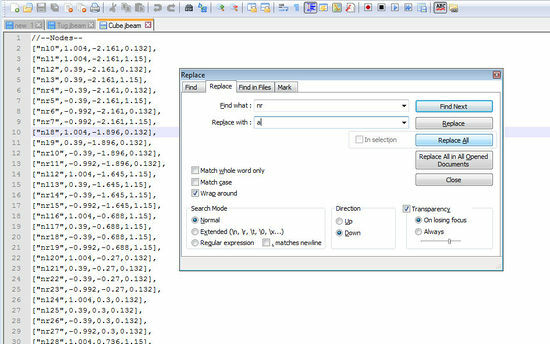 Copy the nodes and beams sections and paste them into their respective sections in the main jbeam file, below the previous node or beam definitions. It's a good idea to add a comment using // to remind yourself what these nodes are for. You may also want to make the axle nodes part of a new group. If you save the jbeam file and reload the vehicle, the axle will now be present and in the correct place, but not attached to anything. We'll need to attach each of the four central axle nodes to each of the four central body shell nodes under it. We've just created four new beams linking b1 to four of the body shell nodes. Now we'll do the same for the other axle beams, for a total of 16 connecting beams on the front axle and 16 on the rear. After reloading, the axles are firmly connected to the body shell and are capable of supporting wheels, which we have yet to add. Before we do that though, let's set up some steering while we still have a clear view of the axles. Because the ends of the axles are free to rotate forwards or backwards, all we need to do is to attach a beam that can expand or contract to move it around. Fortunately such things exist, and they're called hydros. Traditionally the hydros section is placed directly under the beams section, although this isn't strictly necessary. Inside the hydros section we'll define beams by listing the start node and the end node, followed by a few parameters that control the speed and amount that the beam is able to expand or contract. We'll leave steeringWheelLock and lockDegrees at their default values for now, because what we're really interested in is “factor”. This parameter will determine whether the beam expands or contracts (depending on whether it is positive or negative), and the value determines the amount of length change that is allowed. It is usually a good idea to give hydros a lower spring value and more damping than the surrounding beams to avoid super-powerful hydros which might warp the frame of the vehicle. Now that steering is working it's time to put wheels on the axles. Wheels are automatically generated from two nodes in the hubWheels section of the jbeam. However, they also come with a whole lot of parameters that can be adjusted, most of which are self-explanatory with some knowledge of real-life wheels, in addition to the familiar n/b properties such as nodeWeight and beamSpring. The first parameter Is the name of the wheel. The second is the name of the node group (for attaching flexbodies). The third and fourth parameters are the two host nodes that run through the center of the wheel. The fifth parameter is not normally used and may be left at 9999, the sixth parameter is the node used for torque application (where the brake pad would be), and the final parameter controls the wheel direction. Wheels can be very different depending on the vehicle, and yours will likely need a lot of changes to fit your particular car. The parameters above have been tuned to fit the tug and result in large diameter, thick wheels. Once you've added wheels you can reload the vehicle in-game and try rolling it down a hill or pushing it around with another vehicle, although it'll look like something out of Star Wars until we model some visible wheels for it. To do that, let's go back into Blender and add a new object for the front-left wheel, based on a circle with 32 vertices. We can extrude and scale the circle into a convincing wheel profile, and then add smaller, 8-vertex extruded circles for the wheel nuts. After adding a unique material and creating a texture using the same method as for the body, we've finished the first wheel. Now just copy the wheel object three times and rotate the duplicates into their positions. Give each wheel object a sensible name such as WheelFL. Select all the wheels and apply location and rotation/scale, before re-exporting all the visible meshes to the .dae in the project folder. Since we'll need a different material for the wheels, let's open up that materials.cs file we created earlier and define a similar material that uses the wheel texture as its diffuse map. 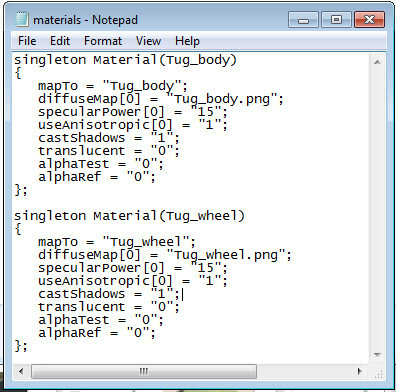 Remember to change mapTo to the name of the wheel material in Blender. To attach these mesh wheels to the jbeam wheels, just expand the flexbodies section to include new lines listing the wheel mesh name and corresponding node group (defined in the hubWheels section). Clear the cache and restart the game. 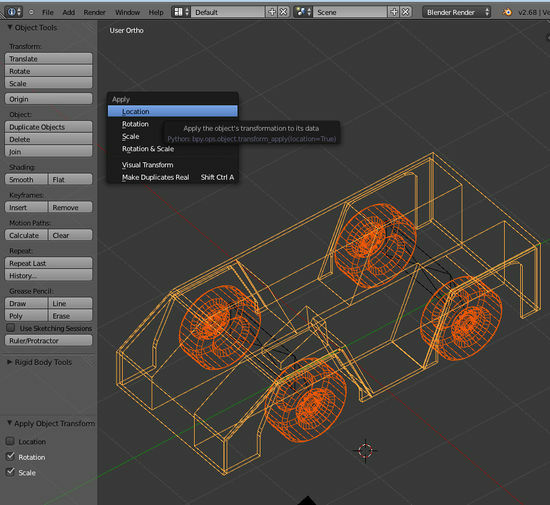 Your model should now be visually complete with textured wheels. If the wheels wobble or orbit the axles when they rotate, go back into Blender and check that the wheel meshes are aligned. 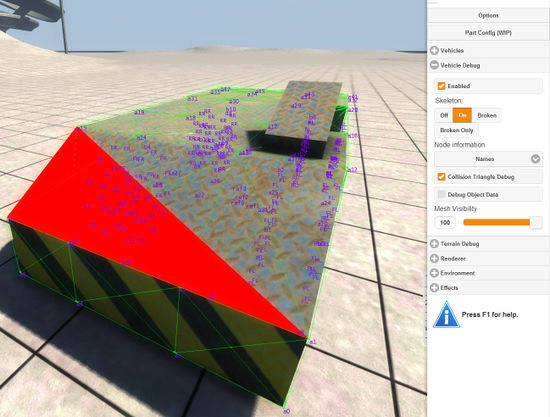 Make adjustments to the wheel position, reapply location, rotation and scale, and re-export. If you haven't manually adjusted the locations of the axle nodes since you exported them, you can just line up the wheels with the axle nodes to ensure the mesh is centered. There is only one step left to make the car drivable, and that involves adding an engine and transmission. Like hubWheels, an engine section contains a lot of unique parameters, most of which correspond to real-life engine properties. These are best explored by experimenting on your own, so for now we'll steal the Ibishu Covet's engine and transmission to make the wheels turn. Usually the engine section will go just above the nodes section. You should not go over 850 on the torque unless you know exactly what your doing. "maxRPM":7500, //Max RPM for the engine, basically a redline. "transmissionType":"manual", //Automatic or manual, setting automatic will restrict the use of manual mode while playing. For my tug I've changed the gear ratios significantly since it has such large wheels – you may have to make changes as well depending on the type of vehicle you are creating. At this point my vehicle is fully drivable, although without suspension the ride is pretty nasty and rear-steer makes it prone to spinning out. These are problems that could be solved with a decent suspension setup, but that's beyond the scope of this already lengthy tutorial. You may have noticed by this stage that the external camera doesn't behave quite like it should. This is because we haven't yet added reference nodes. Let's do that now. Reference nodes let the camera know which direction the vehicle is pointing, and also establish a central point when reloading the vehicle. From this we get a neat triangular pattern of reference nodes just under the vehicle. Connect the reference nodes to the body shell with beams - the same method we used to attach the axles. Collision triangles (coltris) are an essential part of inter-vehicle collisions. Beams cannot collide – only nodes are capable of collision detection, and only coltris can collide with nodes. Without coltris, if we were to attempt to crash two tugs together, they would pass straight through each other. To create coltris, we will set up a new section at the very end of the jbeam file, called “triangles”. Inside the triangles section we can create the coltris by listing the three surrounding nodes. 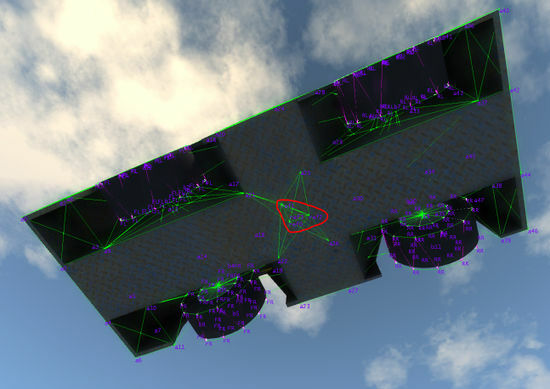 The nodes should be listed in an anti-clockwise direction in order for the coltri normal to point outwards (resulting in stronger collision detection). Creating triangles is a tedious task, and covering an entire vehicle can take a few hours. Don't take shortcuts though, make sure the vehicle is fully closed in by triangles or you may end up with nasty clipping errors in collisions. 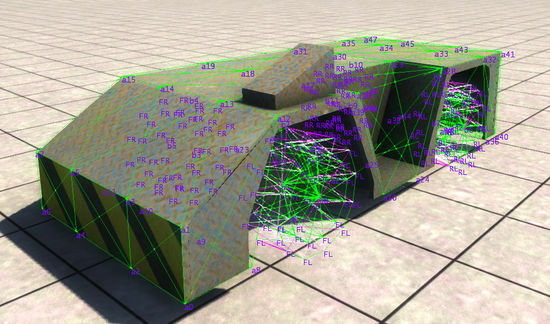 There are many more elements involved in creating a complete vehicle, including props, cameras, lights, breakgroups, deformgroups, and of course suspension, but with the basic skills learned from this tutorial you should be quite capable of grasping those concepts with the help of the relevant Wiki pages.